GLOUCESTER enters with his wife ELEANOR. Why droops my lord, like over-ripen'd corn, Hanging the head at Ceres' plenteous load? Why doth the great Duke Humphrey knit his brows, As frowning at the favours of the world? Why are thine eyes fixed to the sullen earth, Gazing on that which seems to dim thy sight? What seest thou there? King Henry's diadem, Enchased with all the honours of the world? If so, gaze on, and grovel on thy face, Until thy head be circled with the same. Put forth thy hand, reach at the glorious gold. What, is't too short? I'll lengthen it with mine: And, having both together heaved it up, We'll both together lift our heads to heaven, And never more abase our sight so low As to vouchsafe one glance unto the ground. Why does my lord droop like an over-ripened corn, hanging its head at Ceres' rich harvest? Why does the great Duke Humphrey frown as though he were frowning at all his good fortune? Why are your eyes focused on the dull- colored ground, staring at something that seems to darken your sight? What do you see there? King Henry's crown, decorated with all the titles of the world? If that's so, keep looking and lie face down, until your head wears the same crown. Put your hand out and reach for that glorious golden crown. What? Is your arm too short? I'll make it longer by adding mine. And once we've lifted it up together, we'll lift our heads to heaven, and will never degrade ourselves again by taking a single look at the ground. O Nell, sweet Nell, if thou dost love thy lord, Banish the canker of ambitious thoughts. And may that thought, when I imagine ill Against my king and nephew, virtuous Henry, Be my last breathing in this mortal world! My troublous dream this night doth make me sad. Oh, Nell, sweet Nell, if you love your husband, stop the infection of ambitious thoughts. And if I ever think to plot against my king and nephew, virtuous Henry, let it be the last time I take a breath in this mortal world! Last night's troubling dream has made me sad. What dream'd my lord? Tell me, and I'll requite itWith sweet rehearsal of my morning's dream. What did you dream about? Tell me and I'll repay it by telling you sweetly about my morning dream. Methought this staff, mine office-badge in court, Was broke in twain; by whom I have forgot, But, as I think, it was by the cardinal; And on the pieces of the broken wand Were placed the heads of Edmund Duke of Somerset, And William de la Pole, first duke of Suffolk. This was my dream: what it doth bode, God knows. I dreamed that this staff, my badge of office in court, was broken in two. I have forgotten who did it, but I think it was the cardinal. And the heads of Edmund, Duke of Somerset, and William de la Pole, first duke of Suffolk, were placed on the pieces of the broken stick. That was my dream. God knows what it means. Tut, this was nothing but an argument That he that breaks a stick of Gloucester's grove Shall lose his head for his presumption. But list to me, my Humphrey, my sweet duke: Methought I sat in seat of majesty In the cathedral church of Westminster, And in that chair where kings and queens are crown'd; Where Henry and dame Margaret kneel'd to me And on my head did set the diadem. Oh, please, that was nothing if not evidence that anyone who challenges Gloucester in the slightest will lose his head for trying. But listen to me, my Humphrey, my sweet duke. I imagined that I sat on the royal throne in the cathedral in Westminster, and on that throne where kings and queens were crowned, Henry and Margaret knelt to me and put the crown on my head. Nay, Eleanor, then must I chide outright: Presumptuous dame, ill-nurtured Eleanor, Art thou not second woman in the realm, And the protector's wife, beloved of him? Hast thou not worldly pleasure at command, Above the reach or compass of thy thought? And wilt thou still be hammering treachery, To tumble down thy husband and thyself From top of honour to disgrace's feet? Away from me, and let me hear no more! No, Eleanor, then I must reprimand you for this. Bold woman, ill-mannered Eleanor! Aren't you the second highest-ranked woman in the country, the protector's wife, and loved by him? Don't you have everything in this world you could desire, beyond what you can even imagine? And will you then still be talking about treason, which would make both you and your husband fall down from the top of honor to the feet of disgrace? Get away from me and don't let me hear about that! What, what, my lord! Are you so choleric With Eleanor, for telling but her dream? Next time I'll keep my dreams unto myself, And not be cheque'd. But, but, my lord! Are you so angry with Eleanor only because she told you about her dream? I'll keep my dreams to myself next time and won't be told off for them. No, don't be angry. I am all right again. My lord protector, 'tis his highness' pleasureYou do prepare to ride unto Saint Alban's,Where as the king and queen do mean to hawk. My lord protector, your highness would like you to prepare to ride to Saint Alban's, where the king and queen are planning to hunt with hawks. I'll go. Come, Nell. You will come with us, yes? Yes, my good husband. I'll come in a moment. Follow I must; I cannot go before, While Gloucester bears this base and humble mind. 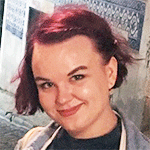 Were I a man, a duke, and next of blood, I would remove these tedious stumbling-blocks And smooth my way upon their headless necks; And, being a woman, I will not be slack To play my part in Fortune's pageant. Where are you there? Sir John! Nay, fear not, man, We are alone; here's none but thee and I.
I have to follow because I can't go in front of you, while Gloucester is of this unambitious and humble mind. If I were a man, a duke, and next in line to the throne, I would remove these annoying stumbling blocks and clear my way to the crown on their headless necks. And being a woman, I won't mind playing the part that fate has prepared for us. Where are you? Sir John! No, don't be afraid, man. We are alone. There's no one here but you and me. What did you say? "Majesty?" I am only a duchess. But, by the grace of God, and Hume's advice,Your grace's title shall be multiplied. But thanks to the help of God and advice from Hume, you'll have a better title. What say'st thou, man? Hast thou as yet conferr'd With Margery Jourdain, the cunning witch, With Roger Bolingbroke, the conjurer? And will they undertake to do me good? What are you saying, man? Have you spoken with Margery Jourdain, the skillful witch, and with Roger Bolingbroke, the magician? And will they help me out? This they have promised, to show your highness A spirit raised from depth of under-ground, That shall make answer to such questions As by your grace shall be propounded him. That's what they have promised—to show your highness a spirit summoned from deep underground. He will answer any questions that your grace would like to ask him. It is enough; I'll think upon the questions: When from St. Alban's we do make return, We'll see these things effected to the full. Here, Hume, take this reward; make merry, man, With thy confederates in this weighty cause. That's all. I'll think about these questions. When I come back from St Alban's, we'll make sure this will happen. [Gives him gold] Here, Hume, take your reward. Celebrate with your partners in this important business. Hume must make merry with the duchess' gold; Marry, and shall. But how now, Sir John Hume! Seal up your lips, and give no words but mum: The business asketh silent secrecy. Dame Eleanor gives gold to bring the witch: Gold cannot come amiss, were she a devil. Yet have I gold flies from another coast; I dare not say, from the rich cardinal And from the great and new-made Duke of Suffolk, Yet I do find it so; for to be plain, They, knowing Dame Eleanor's aspiring humour, Have hired me to undermine the duchess And buz these conjurations in her brain. They say 'A crafty knave does need no broker;' Yet am I Suffolk and the cardinal's broker. Hume, if you take not heed, you shall go near To call them both a pair of crafty knaves. Well, so it stands; and thus, I fear, at last Hume's knavery will be the duchess' wreck, And her attainture will be Humphrey's fall: Sort how it will, I shall have gold for all. Hume must enjoy the duchess' money! And so he will. But what's this, Sir John Hume! Close your lips and give no words, only silence. The business requires silence and secrecy. Dame Eleanor gives gold so I'll bring her a witch. Gold is always useful, even if she were a devil. Yet I have gold that comes from another source. I dare not say that it's from the rich cardinal and from the great and newly-appointed Duke of Suffolk. But yes, that's right. To say it simply, they—knowing the ambitious frame of Dame Eleanor's mind—have hired me to undermine the duchess and whisper these spells to her. They say "a cunning villain doesn't need a go-between." Yet I am a go-between for Suffolk and the cardinal. Hume, if you aren't careful, you'll come close to calling them both a pair of cunning villains. Well, that's how it is, and I'm afraid that at last Hume's villainy will ruin the duchess, and when she's convicted of treason, it will be the end of Humphrey. However it ends, I'll get my reward. Romancikova, Nina. "Henry VI, Part 2 Translation." LitCharts. LitCharts LLC, 19 May 2017. Web. 19 Apr 2019. Romancikova, Nina. "Henry VI, Part 2 Translation." LitCharts LLC, May 19, 2017. 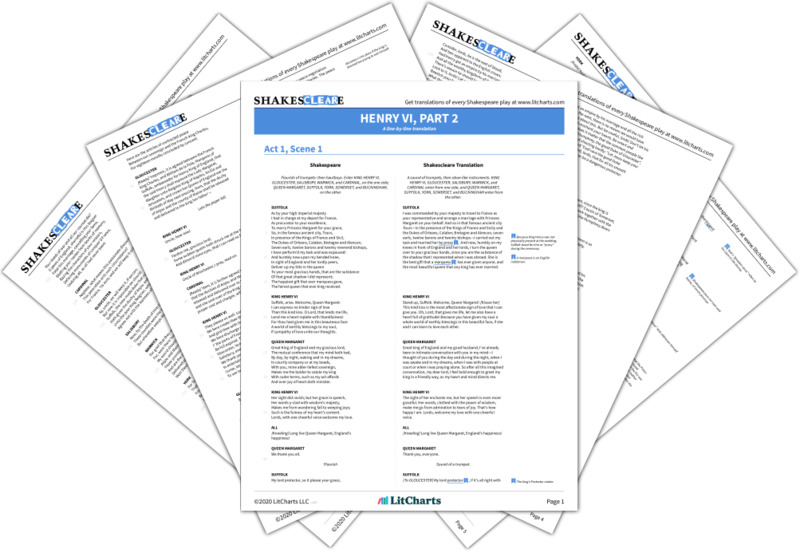 Retrieved April 19, 2019. https://www.litcharts.com/shakescleare/shakespeare-translations/henry-vi-part-2.